Afdhel Aziz is a dynamic and inspirational speaker who has keynoted around the world on business as a force for good, and given workshops on creativity, innovation and change. He has been a featured speaker at the Cannes Lions, SXSW, TEDx, Advertising Week, Soho House, The Gathering, Toms, Omaze, Anomaly, Columbia University and many other events. Prior, for 20 years, he was an award-winning international marketer in London and New York, leading brands at Procter & Gamble, Heineken, Nokia and Absolut Vodka, where he created and ran the marketing innovation-focused Absolut Labs, focusing on VR, AR, and IOT, that was praised by Forbes as 'one of Top 3 marketing innovation labs to emulate.' An expert on brand partnerships and pop culture, he has worked with world-class artists such as Lady Gaga, Deadmau5, and Kanye West, as well as diverse partners like the TED Conferences, Art Basel, Coachella Festival, and the Andy Warhol Foundation. In this inspiring and motivational talk, Afdhel shows how business can be a force for good, by balancing profit with the needs of their consumers and communities. 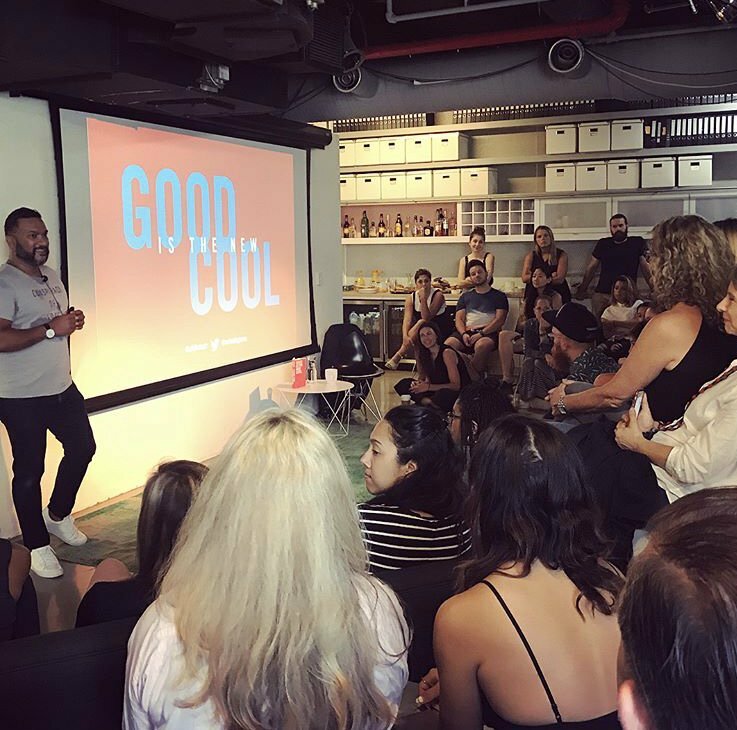 He shares some of the insights from researching purpose-driven brands like Warby Parker, Adidas, The Honest Company and Zappos, who are creating a revolution in business by ‘doing well by doing good’. Afdhel has customized this talk to make it relevant for many industries from CPG, Energy and Fashion to Real Estate, Technology and Hospitality, and is happy to create a bespoke version for your needs. Watch him get a standing ovation at the National Apartment Association conference below. PERFECT FOR: INDUSTRY TRADE CONFERENCES, MARKETING AWAY DAYS, FUTURE TRENDS CONFERENCES. In this talk, Afdhel explores the existential crisis facing humanity in the 21st century: the fact that only 13% of people like what they do for a living. Especially with Millennials and Gen-Z entering the workforce, companies need to find new ways to attract and retain the best talent by showing them how their work ladders up to positive social and environmental impact. Using powerful stories of everyday people who have found ways to do extraordinary things in their work, and unlock their purpose, he shows how people within corporations can unlock their purpose, using the revolutionary 'GPS to Purpose' model which asks : What are your Gifts? What are your Passions? How can you be of Service to others? PERFECT FOR: COMPANY ANNUAL CONFERENCES, HR CONFERENCES, PERSONAL PURPOSE CONFERENCES. An intensive process designed to fast-track the discovery, definition and articulation of brand purpose where one doesn't exist already. A combination of archaeological dig, stakeholder interviews and design sprints by a cross-functional team from brand marketing, CSR and agencies that leads to an 'a-ha' moment which gives the brand a clear path forward that it can activate in 360 , from media and content to retail and brand experience.